What's The Actual Difference Between a Hydrogen Bomb And an Atomic Bomb? A hydrogen bomb is different than a regular atomic bomb, like the ones the US dropped on Japan near the end of World War II. Collectively, the two A-bombs that the US detonated over Hiroshima and Nagasaki killed more than 200,000 people. But an H-bomb is an entirely different beast. It can be up to 1,000 times more powerful than an A-bomb, according to nuclear experts. Here's why. North Korea tested atomic bombs back in 2006, 2009, and 2013. Their blasts were created using fission - the splitting of atoms into smaller ones. Heavy, radioactive forms of elements like plutonium and uranium are especially susceptible to do this. However, if the atoms are quickly squashed very close together, a runaway effect can happen that rapidly splits many, many atoms almost all at once - and releases a catastrophic blast of energy. 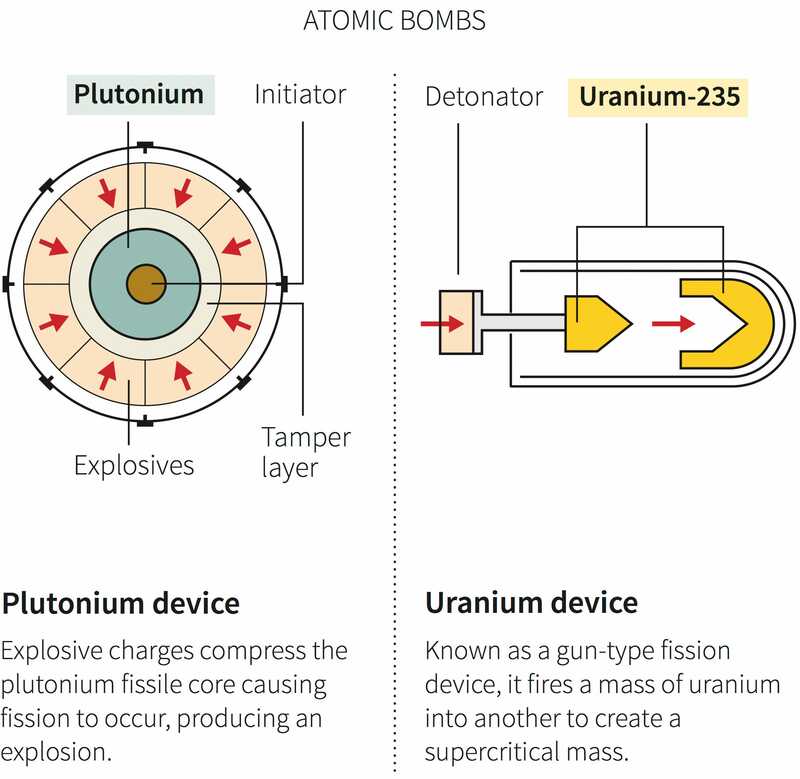 The one of right is a gun-type fission bomb, like Little Boy detonated over Hiroshima, which shoots the missing piece of a nuclear core right into the centre to make it go supercritical. 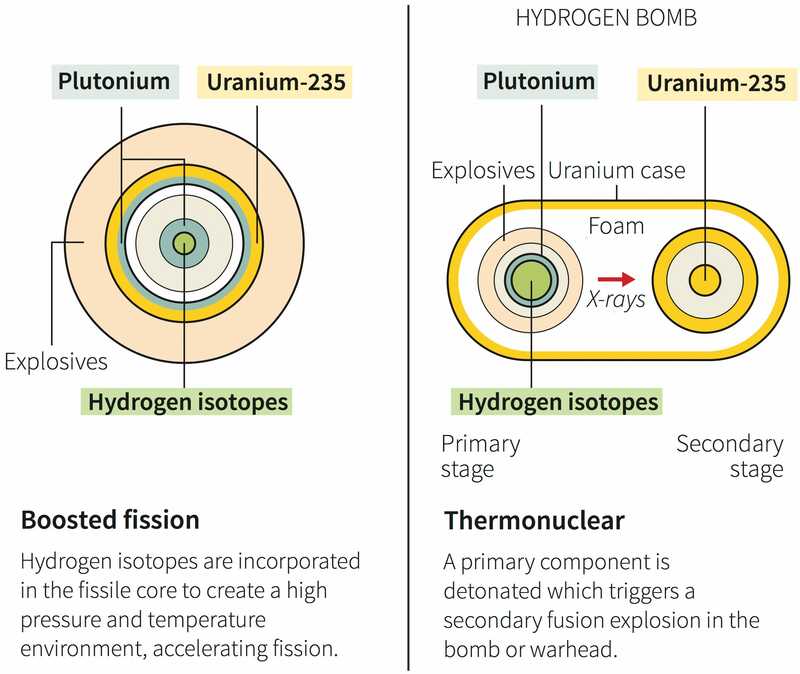 Below is a second graphic showing a boosted atomic bomb and a hydrogen bomb. A special form of 'heavy' hydrogen or deuterium (green), is key to both weapons. Inside an H-bomb, a 'boosted' fission bomb releases a blast of powerful X-ray radiation, which is focused precisely onto the fusion bomb. This happens before the shockwave can blow apart an H-bomb, by the way, since X-rays travel at light-speed and blast shockwaves do not.